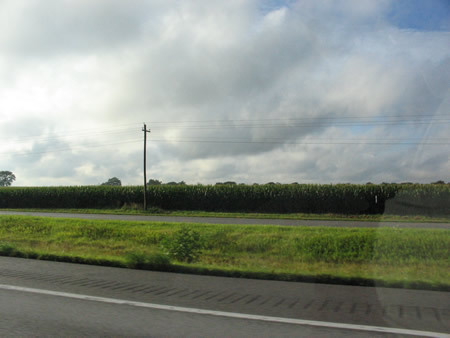 This is the third post in a series of our trip to Columbia Missouri. To read what Padre, Panda Bear, and Meerkat were up to in our absence, check out the Furry Bambinos blog. We got an early start on Wednesday, July 30. 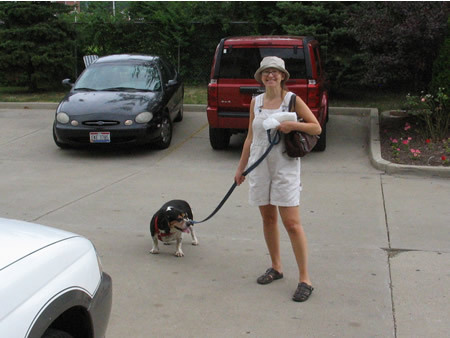 Patty took Bruiser for a short walkie around the parking lot. 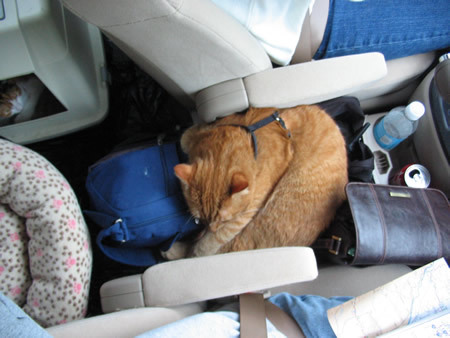 We packed the vehicles with everything we had brought in on Tuesday night … except for Rainbow, one of Patty’s cats. Rainbow refused to get out of the boxed spring of one of the beds in Patty and Chris’s room. Chris somehow managed to get her out, and then we were on our way. We got breakfast at a nearby Tim Horton’s (sort of like a Dunkin Donuts), ate in the cars to keep an eye on our furry friends, then hit the road. With the muffler pipe problem the first day, Chris had found a “speed sweet spot” of 65 to 70 miles per hour at which the noise was more bearable. Our minivan easily cruised along at 75 mph (or more), so Chris and Patty pulled out and started driving about 9:30 am to get a head start. David and I followed at 9:54 am, after taking a phone call from Mom and Dad. I drove the first leg on Wednesday. With David in the passenger seat, I warned him that the Navigator’s job was much harder than the Driver’s job. In about five minutes, David understood why! As Navigator, you have to keep track of the maps, beverages, note-taking for blogging, as well as manage the whereabouts of Cinnamon and Toast! You know the expression, “It’s like herding cats”? 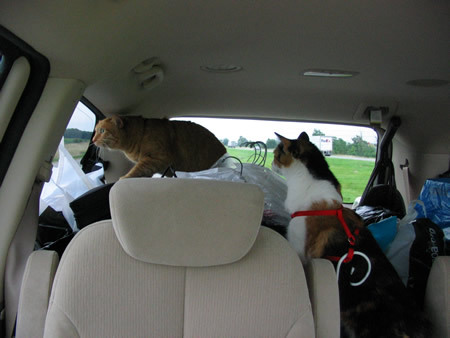 On Day Two, Cinnamon and Toast were no less vocal , but much more interested in exploring the van from front to back. 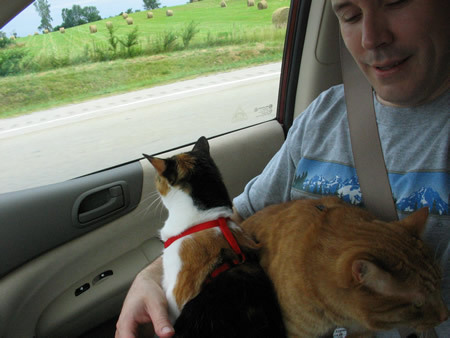 At one point, both Cinnamon and Toast decided to sit on David’s lap at the same time. 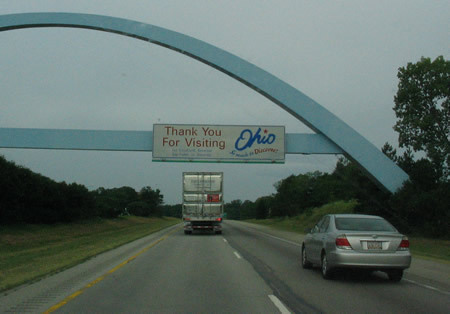 Dayton is in Western Ohio, but we still had about an hour to go before crossing into Indiana. We crossed at 10:25 am. With all the activity going on INSIDE the van, we almost forgot about the scenery! 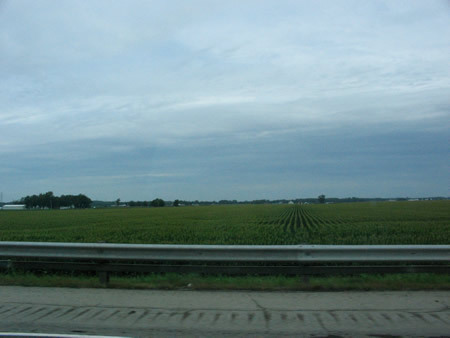 Indiana was largely farmland and cornfields. 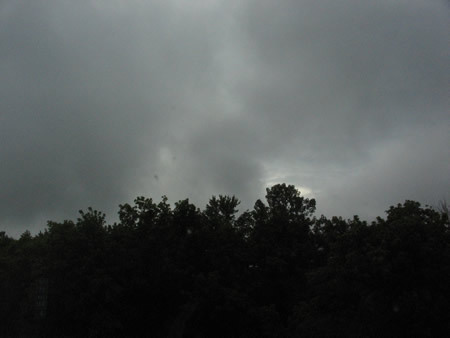 Weather alternated between overcast and light rain. Cinnamon was really worked up that morning. Cinnamon wanted to be absolutely certain that we knew he disapproved of being catnapped and transported across state lines against his will. So he told us, repeatedly. Over and over again. Then he would summarize his points, and then start over at the beginning. Every time Cinnamon meowed, he got Toast going too. Toast sounded like she was yodeling. Cinnamon complained LOUDLY AND OFTEN about being catnapped by strangers. We tried to explain that we were not strangers, that we were Uncle David and Aunt Sue, but Cinnamon would hear nothing of it. Between David’s play-by-play as to which cat was where, Cinnamon meowing, Toast yodeling, cell phone calls from Patty, trying to pay attention to driving, and listening to “The Best of Queen”, I REALLY NEEDED A STIFF DRINK by the time we got to our first rest stop. 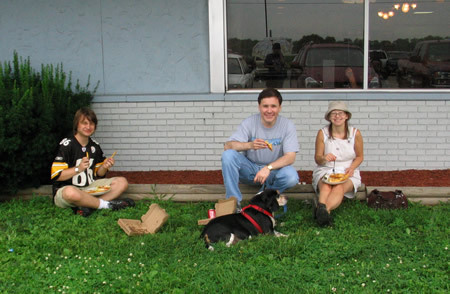 We stopped for lunch at 11:54 am at a rest stop off exit 59 in Indiana, at a TA (134 miles from our starting point north of Dayton). It was raining lightly, so we sat near the vehicles under an overhang. David and I had pizza, Chris got a burger, and Patty had French Toast with syrup. 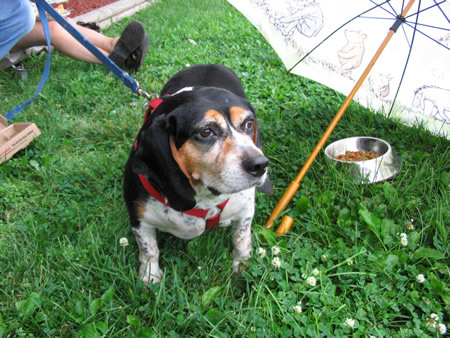 Bruiser’s food was in a bowl under Patty’s Winnie the Pooh umbrella. 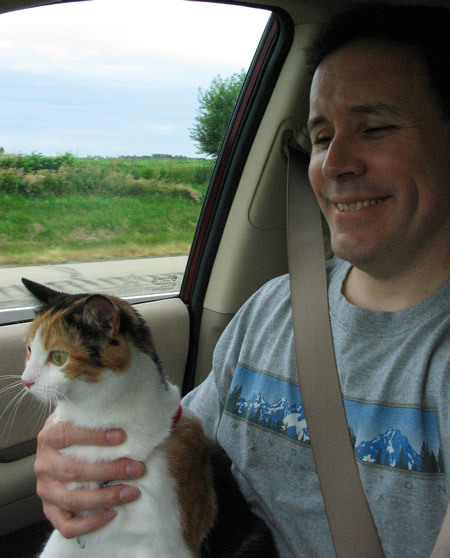 Chris gave Cinnamon some “Kitty Calmer” medication during the rest stop. We switched drivers after lunch, with David at the wheel and Sue as Madame Navigator. Bought gas at the Citgo gas station at the TA stop. 6.9 gallons @ $4.00 per gallon = $27.56. Hit the road at 12:58 pm EDT. 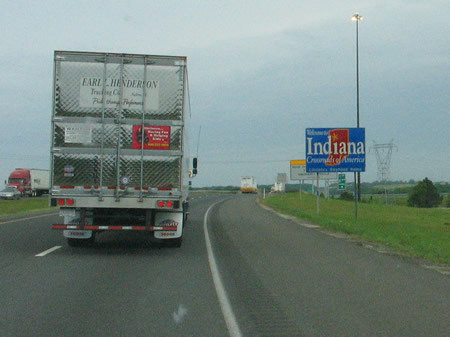 We entered Illinois at about 1:48 pm EDT (12:48 pm CDT) at 609.0 on the mileage counter. This meant we also entered the Central Time Zone. During this leg of the trip, Cinnamon’s kitty valium kicked in, and he napped on my lap. When Cinnamon calmed down, Toast calmed down as well. She mostly slept under whichever chair I was sitting in. 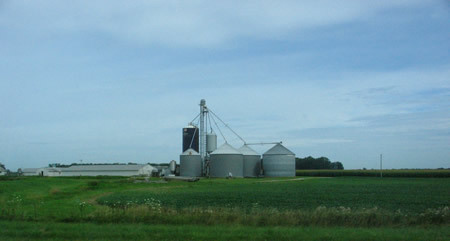 We stopped again for a break near Effingham, Illinois, about an hour inside the eastern border. 2:37 pm EDT (1:37 pm CDT). Mileage 667.1 on the trip counter. Cinnamon was an entirely different cat! Very mellow, dudes! 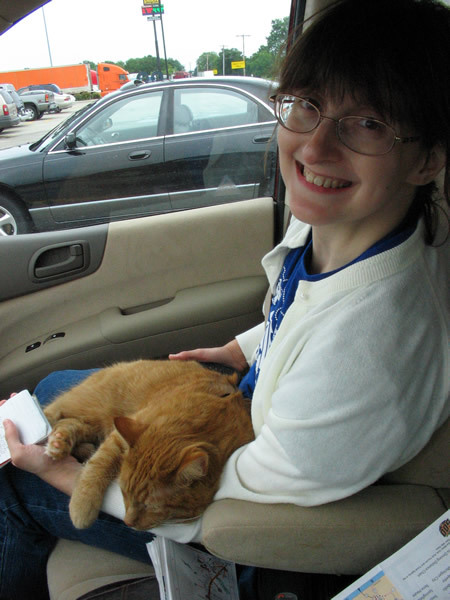 Cinnamon also attempted to sleep on my lap while I was driving. 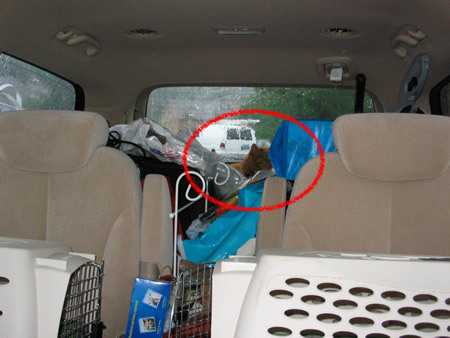 He would try to climb up into the driver’s seat along the driver’s side window. There was one time where I had to drive with my right arm, and hang onto Cinnamon with my left arm. 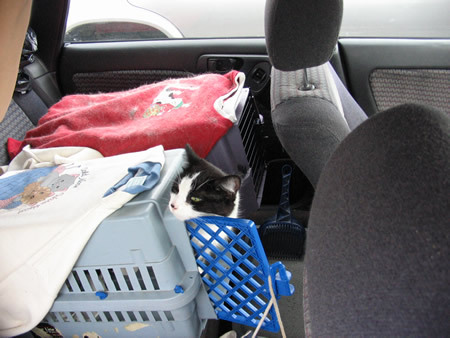 Finally, he settled down on some bags between the driver and passenger seats up front. 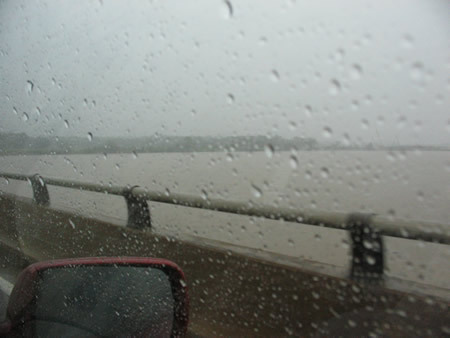 When we crossed the Mississippi River in heavy rain, we left Illinois and entered Missouri at 4:37 pm EDT (3:37 pm CDT). 763.3 on the trip counter (599 miles out from Pittsburgh). 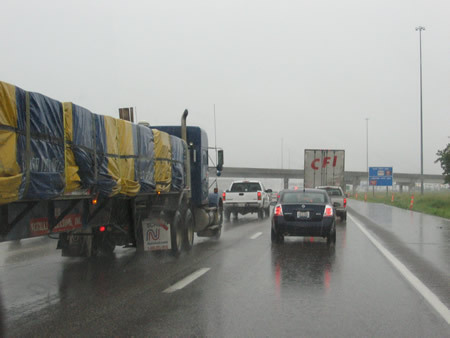 We hit rush hour traffic and heavy rain on the highway north of St. Louis Missouri. 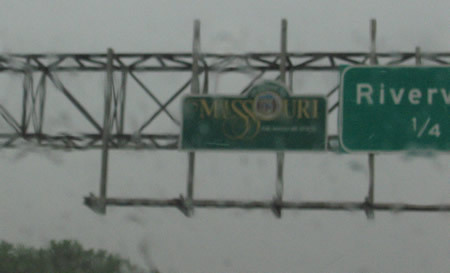 Patty radioed us on the walkie-talkie, “Welcome to Missouri, the Monsoon State”! We got off the highway because of traffic backups, and made a gas pit stop at a 7-11 in the St. Louis area at 4:56 EDT (3:56 pm CDT). 10.28 gallons @ $3.68 per gallon = $37.83. Trip counter at 774.6. We got back on the road to cross the Missouri River at 5:22 pm EDT (4:22 pm CDT), trip counter at 782.4. We stopped for a rest at a McDonald’s at the first exit over the Missouri River in St. Charles, MO, at 5:25 pm EDT (4:25 pm CDT). 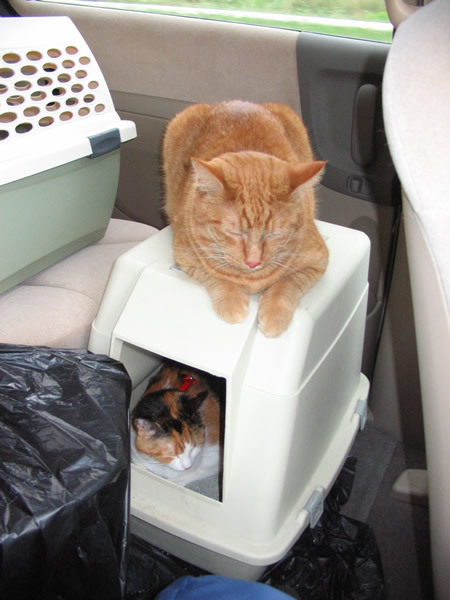 Cinnamon and Toast had been exploring the van again, and were napping in the far back with the luggage. That’s Cinnamon way back there. We got back on the road at 6:02 pm EDT (5:02 pm CDT), and got stuck in very heavy traffic, in very heavy rain outside of St. Charles. 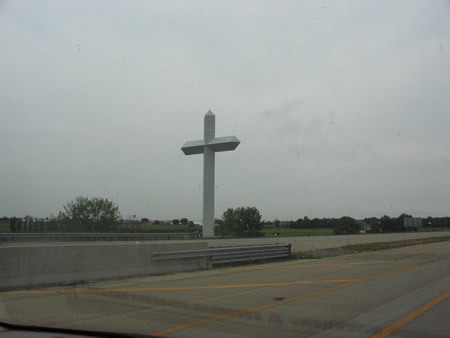 It seemed to take forever to get through St. Charles and the Northern suburbs of St. Louis. In fact, it took us 45 minutes to go 11 miles! We heard on the radio that there was an accident in the area. 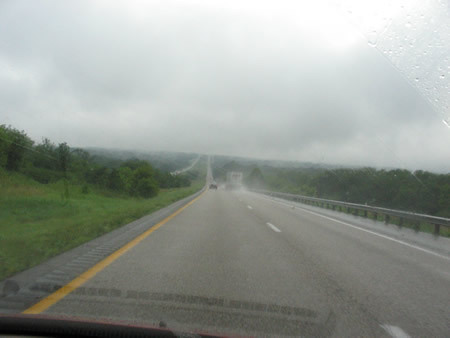 Once we finally got to the outskirts of St. Louis, traffic thinned out a bit, the rain got lighter, but the skies were still ominous. About two hours later, nearing the outskirts of Columbia, the skies brightened, and THE SUN CAME OUT! It was as if the skies were parting for Patty and Chris to welcome them to their new home! Approximately 10 hours and 15 minutes of total travel time on Day 3. 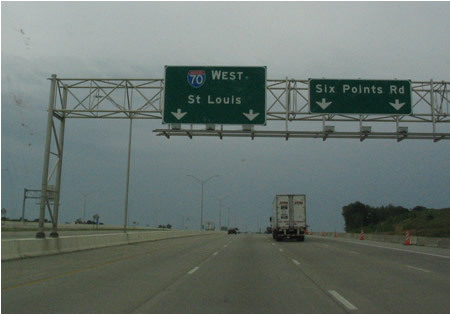 This includes approximately 2 hours 15 minutes of “rest” for lunch, gas, potty breaks, etc., and about one hour of slow traffic north of St. Louis. So, total time of “forward progress” was really about 7 hours. Total mileage Day 3: 469.5 miles from Northern Dayton to the Hampton Inn in Columbia, Missouri. We took turns unloading our luggage from the van and freshening up at the Hampton so as not to leave the cats unattended, and then drove the short distance to Patty & Chris’s house. They live less than 3 miles from the hotel. 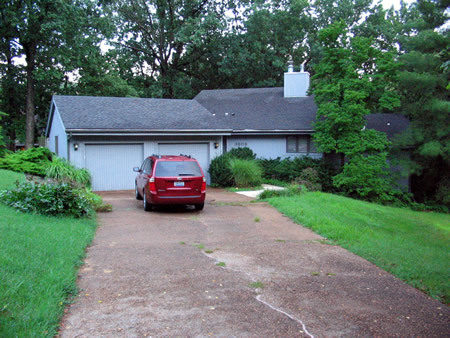 Arrived at Patty & Chris’s house at 8:55 pm EDT (7:55 pm CDT). We brought Cinnamon and Toast inside the house, unloaded the rest of the van, got the tour of their house, and then went out to dinner at a local Macaroni Grill. Everyone was tired, so we headed back to the hotel, and Patty and Chris to their house, for the first night in Columbia. Arrived at the hotel at 10:57 pm CDT, 899.7 on the trip counter. To us, it felt like 11:57 pm (which it WAS in the Eastern time zone). A long day!